When last we left the field of a meaningful NFL game, Tom Coughlin was hugging Flavor Flav. Yes, hugging Flavor Flav, who was decked out in Giants gear and had his customary oversized clock around his neck. There wasn’t a chance in Indianapolis that the 66-year-old Coughlin knew who the former member of Public Enemy was. Frank Sinatra, yes. But Flavor Flav? No. Yet there was Coughlin, hugging Flav and anyone else at Lucas Oil Field who wanted to embrace him. Funny. A few months earlier, fans were trying to run Coughlin out of New York. Now, after beating the Patriots 21-17 to win Super Bowl XLVI — his second title in four years — Coughlin has a job for as long as he wants it. That’s life in the National Football League. Goat one minute. GOAT the next. It will be a long and torturous trek to New Orleans, site of Super Bowl XLVII. There are traditionally two paths to the Super Bowl. One is sustained excellence. Dominance. Just being better than everyone else, every day, every week, every game. Then there is simply getting hot at the right time and making a run, like the Giants last season and the Packers the season before that. Those teams make the playoffs more difficult to predict, but they are fun, toughened by the bumps of a tumultuous 17-week season and employers of the us-against-the-world mentality. How will we get to New Orleans? What will we find there when we do? The only thing certain is Sean Payton won’t be there. 1. Can the Super Bowl champs repeat? William Perlman/US Presswire Nobody with a lick of sense is lampooning Eli Manning for suggesting he’s an elite quarterback these days. Sure they can, and the reason is simple: the quarterback. Six quarterbacks have won the past nine Super Bowls: Tom Brady, Ben Roethlisberger, Peyton Manning, Drew Brees, Aaron Rodgers and Eli Manning. In the NFL these days, it all starts with the quarterback. 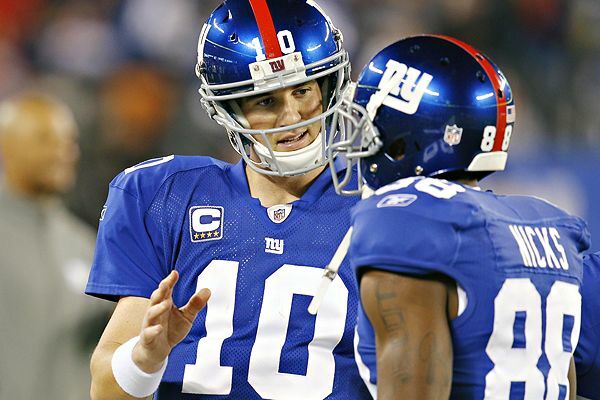 Before last season, Eli Manning said he considered himself an elite quarterback. It made back-page headlines for the New York tabloids, in part because the normally bland Manning actually said something somewhat controversial. Some laughed. Then he went and proved — again — that not only is he elite, he is incredibly clutch. He doesn’t wilt when his team is behind in the fourth quarter. He doesn’t choke in big moments. Manning earned his spot among the big boys and now has won two Super Bowls. He gives the Giants, who have weapons on offense and a typically relentless pass rush, a terrific chance to get to New Orleans. Thirteen times in the Super Bowl era, the defending champs have missed the playoffs the next season. This Giants team won’t join that list. 2. Will Jerry Jones ever get his? Zing. Then late last week, Mathias Kiwanuka reminded everybody that, actually, it’s the Giants who have been kicking around the Cowboys of late, winning six of the past eight regular-season meetings, including both last season. By the way, they’ve won two of the past five Super Bowls, whereas the Cowboys have won only one playoff game since 1996. Tony Romo gets it. He knows quarterbacks are judged on championships, and unlike Manning, he hasn’t done much in the postseason to show that he’s elite. Maybe he will this season, but playing in a division with three other talented quarterbacks will make it tough for the Cowboys to even reach the playoffs. Jones has said that the window for this team might be closing. I think he’s right. 3. What will we see out of Eli’s brother? AP Photo/Jack Dempsey It’s going to be strange seeing Peyton Manning wearing orange for the first time since college. I’m thrilled that Peyton Manning is back playing, as jarring as it is to see him in a Broncos uniform. The league is more fun to watch with two Mannings as opposed to one. 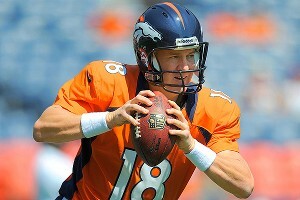 Certainly, Manning has had to make a slew of adjustments this offseason. He has new teammates, new coaches, a new offense, a new city. So much is new after 13 years in Indianapolis that Manning has said he feels like a rookie. Only he’s not. He’s a four-time MVP coming off a series of neck surgeries. Manning has also said he’s a work in progress, but while he might have limitations from the surgery — throwing deep to his right being one of them — he has the intelligence to counteract it. He makes Denver a contender. Demaryius Thomas and Eric Decker are about to become household names. 4. Will Joe Vitt go down as the best interim coach in NFL history? More immediately, will Aaron Kromer go down as the best interim-interim head coach in league history? Yes, and yes. Let’s face it. There’s not a lot of competition there. It’s a good decision to have Kromer fill in for Vitt for the first six games of the season until Vitt can come back and fill in for Payton. It creates the least amount of havoc in a situation that has been fraught with havoc. This way, Pete Carmichael can focus on running the offense, and Steve Spagnuolo can focus on running the defense. The Saints’ first six games are against Washington, at Carolina, Kansas City, at Green Bay, San Diego and at Tampa Bay. If Kromer finishes above .500, that would be quite an accomplishment. 5. How long before Michael Vick gets injured? AP Photo/Steven Senne Michael Vick, seen taking a shot in the preseason, has played 16 games in a regular season just once. Eagles fans will be holding their collective breath all season hoping that the hit that takes out their quarterback never comes. 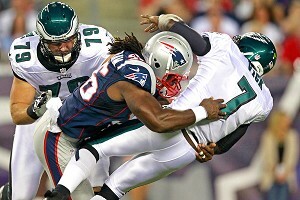 But it seems an inevitability that Vick will get hurt, given his style of play and his history. He missed three games last season with broken ribs and suffered another rib injury in the preseason. Know this: Vick burns for an opportunity to play in the Super Bowl. He told me during training camp that he thinks about it “all the time, so much that I’m tired of thinking about it. To get there, Vick will have to stay healthy. 6. Who will surprise us? The Chicago Bears‘ offense. Jay Cutler has no more excuses. He has a true No. 1 receiver in Brandon Marshall. He has a speedster who’s a matchup nightmare in Devin Hester. He has depth at receiver with Earl Bennett and rookie Alshon Jeffery. He has two very different, very capable backs in newly re-signed Matt Forte and Michael Bush, who can carry some of the load for Forte and get the Bears a third-and-1 conversation late in games. So the left side of the line is a little shaky. This is about Cutler taking it to the next level, about elevating his game and not complaining and moping because he doesn’t have enough help. He has help now. This team should be able to hold its own against explosive offenses like the one that resides in the great state of Wisconsin. We won’t have to wait long to find out if that’s the case. 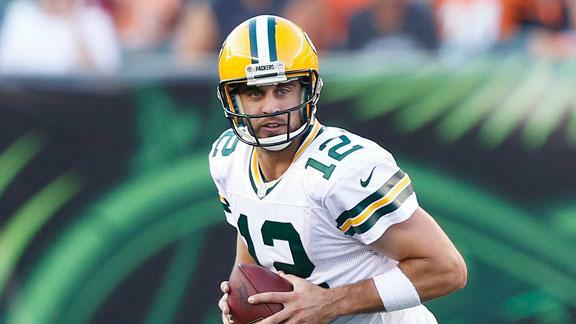 The Bears travel to Green Bay in Week 2 for a nationally televised Thursday night game. 7. Who will disappoint us? AP Photo/Matt Rourke Some pundits can’t wait to create a Jets quarterback controversy … and wait for the dysfunction to erupt. The Jets. The circus surrounding their quarterbacks will continue to entertain, but something needs to be done about their offense. It was abysmal in the preseason. In the first three exhibition games, the Jets didn’t score a touchdown. 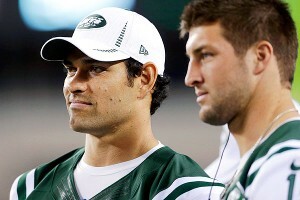 That included 15 possessions for Mark Sanchez and 15 possessions for Tebow. In 35 total possessions, the Jets managed 21 points off seven field goals. They finally scored a TD in Week 4 of the preseason — with Greg McElroy under center. Maybe Wildcat, short-yardage and goal-line packages utilizing Tebow will make a difference. The Jets, understandably, didn’t want to put their plans on preseason tape. But this team looks as if it will be ugly early. 8. Which coaches will be under the most pressure to win early this season? Norv Turner in San Diego and Andy Reid in Philadelphia. Both men need to lead their teams to the playoffs, at the very least, after narrowly missing the postseason with matching 8-8 records in 2011. It’s not so much that either man is in jeopardy of losing his job midseason. But both fan bases are frustrated. The Chargers endured a six-game losing streak last season after starting 4-1. The Eagles didn’t get on track until they were 4-8. Quick starts would buy both coaches breathing room. 9. Which player will become a breakout star? Julio Jones, the sophomore wide receiver in Atlanta. He’s fast. He’s got good hands. He’s playing in an offense with an array of weapons. And he’s got a quarterback who can get him the ball. Look out. 10. What team will go from worst to first? 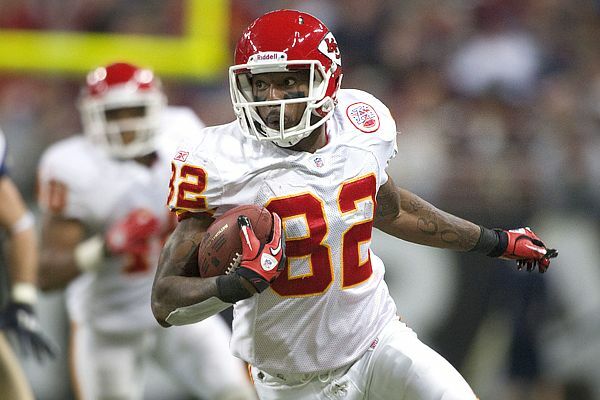 this season, it just might be Dwayne Bowe’s Chiefs. It has happened every season since 2003. A team finishes last in its division only to rebound the next season and win it. The most recent examples: Denver, which improved from 4-12 in 2010 to 8-8 in 2011; and Houston, which tied for last at 6-10 in 2010 and went 10-6 last season. Because of the collective strength of the defending division winners, and the collective weakness of last season’s cellar dwellers — six of the eight finished 5-11 or worse — this could be a season like 2002, when no team went from worst to first. If it does happen, the leading candidate would be Kansas City, which finished 7-9, one game behind Denver. But with the addition of Peyton Manning, the Broncos should win what should be a hotly contested AFC West. 11. Who will be the division winners? New England will win the AFC East, but given its utter dominance over the past decade, you already knew that. Baltimore will again beat out Pittsburgh in the AFC North, and that sound you hear is John Harbaugh screaming in celebration. Houston will prove that Gary Kubiak is a better coach than everyone gives him credit for with a second consecutive AFC South title. And John Elway will prove that not only was he a baller as a player, he’s one as an executive. Can you say Executive of the Year? The Giants won’t have a Super Bowl slump, because Coughlin knows what he’s doing. The Packers will win what should be the toughest division in football because their quarterback is better than all the rest. Atlanta will be explosive and win its second NFC South title under Mike Smith and Matt Ryan, but no one will care until the duo finally wins a playoff game. And San Francisco will show it isn’t a one-hit wonder. 12. Who will get the wild cards? Pittsburgh is aging out, but not quite yet. Kansas City will get just enough from Matt Cassel to sneak into the playoffs. 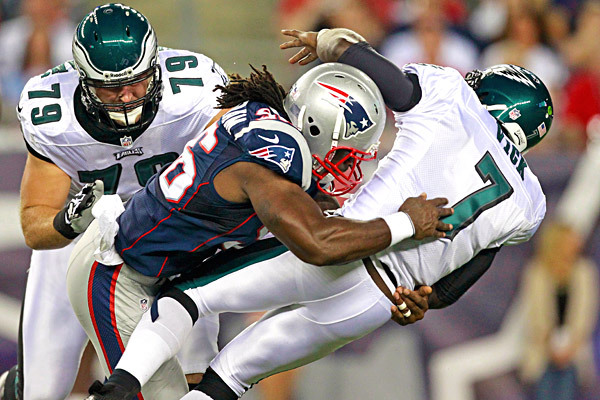 Philadelphia will have a dominant pass rush and an explosive offense — as Eagles fans spend all season fearing that next big hit on Vick. Cutler will take advantage of having the biggest array of toys at his disposal and get Chicago back into the postseason. 13. Who wins it all? Tom Brady will win the Most Valuable Player award, joining Brett Favre and Peyton Manning as the only three-time winners (Manning has won four, and counting). Bill Belichick will cement his spot as the greatest coach of this era with his fourth Coach of the Year award. And the Patriots, with their receivers and tight ends creating mismatches all over the field and a defense that will bend but won’t break, will win their fourth Super Bowl in their seventh try since the 2001 season. New England, Green Bay, see you in the Big Easy.